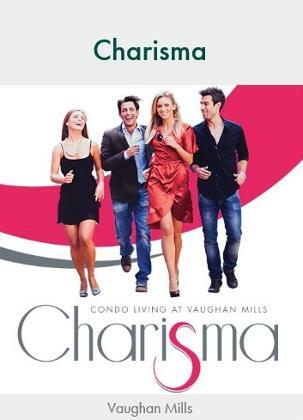 Charisma is a new condo project by Greenpark Homes currently in pre-construction in Vaughan, Ontario. 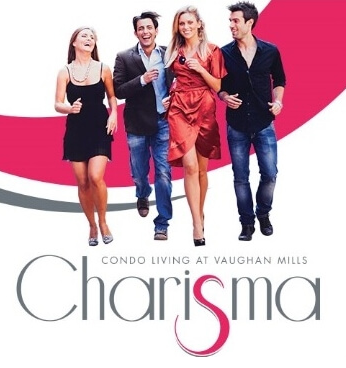 "Charisma will be Vaughan's most prestigious residence offering an oasis of elegant living just steps from the world class shopping and entertainment at Vaughan Mills Mall." these new high-rise towers project will launch in Spring/Fall 2017. There is very little information right now regarding this master-planned residential community but from the information that we can gather, this new mixed-use residential and commercial development will be located on the west side of Jane Street south of Rutherford Road right by the mega shopping mall. Charisma is a proposed 5 towers situated in 3 buildings. This is a revised plan from the original proposed 6 towers concept. 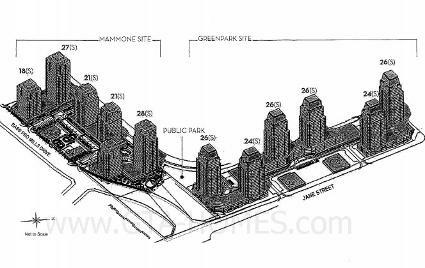 The revised proposal consists of two 30-storey apartment structure, one 26-storey and two 28-storey apartment buildings. The podiums range from two to six storeys that will hold residential units and commercial uses. 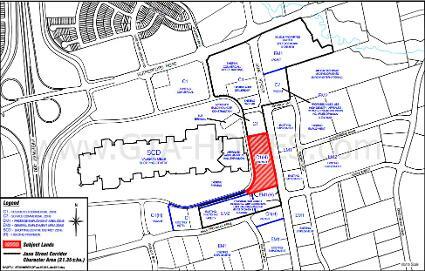 There will be a proposed 1,814 residential apartment units and 3,014 square metres of commercial gross floor area. The layouts that will be offered at these fantastic pillars are 1 bedroom, 1 bedroom plus den, 2 bedroom, 2 bedroom plus den and 3 bedroom suites. Prices will be starting from the Mid $200's and upto $600,000. There will be a proposed 2,573 parking spaces available of which 272 are for visitors and 91 are for commercial parking spaces. There are also many new projects coming soon to the City of Vaughan like SmartCentres Place Condos. These prime real estate site location gem will be located in a very popular area by Jane Street and Rutherford Road. This area is situated right beside the massive mall and the amusement park Canada's Wonderland is just a few blocks away. This area has an abundance of office buildings, retail plazas, schools, shops, parks...basically everything you need within your vicinity. There is also accessible public transportation with the Go Station not too far away. Charisma is also located near Highway 400 and Highway 407 making getting around the city a bit easier. This is a vibrant community with entertainment, shopping and the annual Santa Claus parade just minutes away. York University is a few kilometers drive south of the site and with the new subway extension in the works, getting around by public transportation will be more efficient and a lot faster. We will update our site accordingly once new information arises. Register with us today for Brochure, Floor Plans & Price List. Register today for more information on this Greenpark project! Register today for the Floorplans and Price List. Please Call or Register now for the Platinum VIP Preview Sales Event. For over 45 years, Greenpark has been a leader in the new home industry, recognized as the standard quality, choice and service excellence. These same principles were instrumental in successfully establishing Greenpark in the High Rise Condominium marketplace. Since 2002, Greenpark has seamlessly executed sell out residential suites in both urban and suburban locations with a combinations of impressive architecture, luxurious finishes and intelligently designed suites and amenities. Backed by our award-winning commitment to quality, Greenpark ensures the peace of mind you deserve for your most important buying decision. Greenpark Homes is a Tarion registered builder. Builders who register with Tarion have to uphold the strict guidelines of the Ontario New Home Warranties Plan Act that regulates new home builders and protects new home buyers. Greenpark is proud to be part of this so that they are "guaranteed to maintain a high standard of construction, and to provide our customers with peace of mind through outstanding warranty protection". Greenpark Homes is an award-winning real estate developer that has been in business since 1967. More than 55,000 customers have bought homes from Greenpark. This developer builds quality homes ranging from townhouses to semi-detached homes to detached homes to high-rise condominium buildings throughout the Greater Toronto Area. Partners Steven Kirshenblatt and Clifford Korman founded Kirshenblatt Korman Architects in 1980 now operating as award-winning architectural firm Kirkor Architects and Planners. They have a mix of about 60 architects, interns and technologists. They have both local and international clients that they work with in creating sustainable developments. They are experts in "urban design principles of intensification, mixed-use development and public transportation that are necessary to ensure holistic, healthy building practices". The right kind of people to design the right kind of place in the right location. Together Greenpark Homes and Kirkor Architects & Planners will collaborate to design and build this new site coming soon to the Vaughan Mills area. Register here today to have First Access to these luxury buildings. Red indicates where proposal is located.